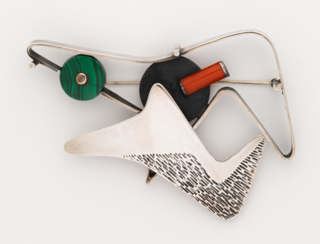 Pin (sterling silver, coral, malachite), circa 1947-50. 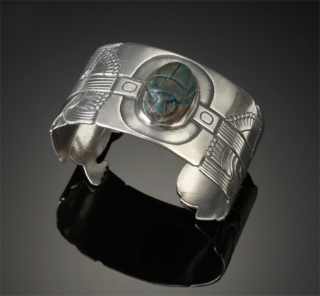 Bracelet (sterling silver, turquoise), 1933. At the School of Design in Chicago (1941), where Margaret took a course from László Moholy-Nagy and met future husband Gene Bielawski. 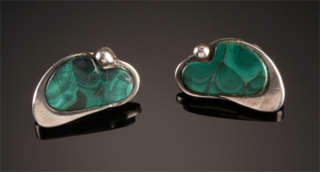 Earrings (sterling silver, malachite), 1941. After remodeling her Glen Park home, on Laidley Street, and designing and building much of its furniture, De Patta told the San Francisco News about her "increasing interest in remodeling houses." She had long been interested in architecture, and described her jewelry in architectural terms. In the 1950s, for a trip to Mexico with Gene, De Patta converted a Volkswagen van into a camper van, Martha Bielawski says. There was a restless quality to De Patta. Michael Elkin, who visited her on Laidley Street in 1945, wrote, "Most of all the house reflects De Patta because she doesn't like it anymore." "Her ideas have flung themselves beyond what lies in the house; and already she is planning a new one. And that, beyond all else, is characteristic of the artist." A year later, with her new husband, De Patta embarked on two major endeavors—Designs Contemporary and the creation of a school and retreat for artists. Both seem to have been instigated by Gene Bielawski, an industrial designer who'd loved his time at the School of Design and hoped to recreate the experience in California, Martha Bielawski says. The Bielawskis' art school began with the purchase of 30 acres in Napa. Although they gave some lectures and workshops, the school never took off. In Napa the couple converted a 40-year-old farmhouse into what the Napa Register called "one of the most striking modern residences in the Napa Valley." It had a 40-foot wall of floor-to-ceiling windows, a fire screen held in place by magnets, and a dining table of De Patta's design that was topped with terrazzo. Instead of dishes, De Patta served meals directly into dish-shaped hollows carved into the terrazzo. But, Martha Bielawski recalls, the food would quickly turn cold. And some guests objected, she adds. "Imogene Cunningham said, 'You mean we're supposed to eat out of this?!" De Patta ending up buying plates from Heath ceramics. Just as Edith Heath, a ceramicist, and Brian Heath, her husband, turned Edith's handmade pottery business into a production business in 1946, so too did Margaret and Gene Bielawski a year later with her jewelry. Margaret told Arts & Architecture that year that the goal was "to produce more than one piece of each design and to sell these pieces at…a figure to compete with the comparable material quality costume jewelry." 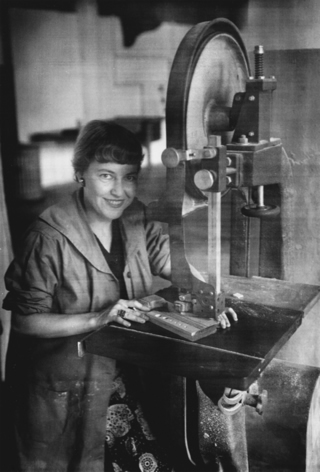 Employing a process that she later described as "somewhat similar to the method of making dental inlays," De Patta would make a design, usually in silver, which would be used to create a mold. Gene would cast up to 65 production pieces from each mold, which De Patta would trim and finish by hand. By the late 1940s De Patta's custom and production jewelry could be seen in a trend-setting exhibit at New York's Museum of Modern Art (1946), and in shops and museum exhibits across the country. "It's fascinating stuff, all modern and shiny, combining semiprecious stones with steel screen, crystal, and sterling silver," the Tucson Daily Citizen wrote in 1952. "See it—it's like nothing else in the world." De Patta even made it into New York City's "scintillant sanctuary of the priceless gem," Black, Starr & Gorham. The San Francisco Chronicle reported that De Patta was "understandably elated, and more so when Black, Starr's conservative clientele began to buy and kept on buying." In fact, Black, Starr & Gorham only sold one ring and two to three cufflinks, Cabella says. "Sales to date have been a good deal lower than we had anticipated," the Hughes Gallery of Houston wrote in 1949. Three years later the Lubbock, Texas shop Design Today returned all six of her pieces. "Our customers thought they were beautiful…but the price. Give us time and we will educate them for that, too."